It’s here! Second Life announced their new viewer specifically for the Oculus Rift is now available for download. This means users of Oculus Rift will be able to get a full, immersive experience in Second Life. Second Life has been in the virtual world business for over 10 years, so there is solid community and an enormous amount of rich content. Being able to view it as a fully immersive environment is going to be amazing. Here are some of the features, according to Second Life’s news release. Check out the video below. Full Oculus Rift Hardware Support – includes automatic hardware detection and display calibration for quick and easy setup. Full UI Support – users can access the entire Second Life UI and HUDs while in Oculus Rift mode, so there are no limitations on what a user can do inworld while using the headset. Customizable UI – users can tailor the settings for Oculus Rift mode that work best for their needs. Avatar Head Motion – Oculus Rift head-tracking data is mapped to the avatar, so users’ avatars look where they do. New First-Person View – allows users to enjoy the immersion previously available with mouselook mode, but thanks to the Oculus Rift, the mouse is free again to control the cursor, allowing for interaction with the UI and objects inworld. “Align to Look” – allows users to quickly start moving the direction they are looking. “Action Key” – interact with objects by pressing a key, works great in mouselook mode. Wired posted an article recently about a book that should be on the “to buy” list of everyone whose library has a makerspace: Leo the Maker Prince. Characters from the book can be 3D printed. What an excellent way to excite kids about technology! At the Imagine.Create.Innovate conference held at Rochester Public Library, there was a lot of talk about the future of libraries. Where we are now. Where we might be going. What we need to do if we are to move in a direction that helps libraries and, more importantly, helps our communities. Jamie LaRue was keynote speaker for the first day of the two-day event. The short version of his speech: “The mission of the public library is to gather, organize, and present to the public the intellectual content of our culture.” Wait, that’s big. Let me say repeat that. This means not only curating and preserving, but also enabling those who create the intellectual content of our culture. Providing free access to it. Publishing it. And of course, sorting it and cataloging it all. The “threat” of ebooks has many wringing their hands wondering if libraries can remain relevant going forward. Jamie did extensive research before embarking on the creation of a digital library branch for his community. He found that 20% of his readers prefer ebooks. Despite this, his library’s ebooks comprised far less than 20% of the collection. He noted that his collection of ebooks is always checked out. The same is true in Rochester – we just don’t have enough ebooks yet to meet the demand. The fact is, publishers are making it very difficult for libraries to circulate ebooks. The restrictions are high. The costs are high. And many publishers won’t sell ebooks to libraries at all. So what is a creative, innovative solution to this problem? If you ask Jamie LaRue, he’ll tell you to spend less time worrying about the Big Six publishers and focus your efforts on independent small press publishers and self-publishing authors. He set up an Adobe Content Server for ebooks that his library would purchase. He set up a second server at clicweb.org for items in the public domain. He dug up Creative Commons content. And then he set up agreements with publishers. The result of all this is a ebook catalog that pulls together all econtent to one place. Adobe Content Server attaches DRM, and regulates the check out to Adobe-enabled devices in order to restrict the use to one user at a time, and to disable the content at the end of a due date. Take a look at Douglas County Library’s digital branch. They have set a precedent with this, which is useful to all of us. Augmented Reality: What’s Coming and How Does it Affect My Library? Next month, along with members of our Emerging Technologies Committee, I will be giving a talk on augmented reality for staff members in my library system. This is a big thrill for me, as I have spent the last ten years excitedly watching and anticipating AR’s development. It has now burst through its embryonic sac and is quickly becoming a part of our daily lives. The rapid formation of an information layer on top of our reality should cause librarians to sit up and take notice. As information specialists, libraries should be leading, not following, in this opportunity. The tools to create something useful have never been easier. QR codes are extremely simple to use (Google “QR code generator” for a slew of free options) and can be an early stepping stone for people to begin dabbling in the creation of an information overlay. Why not slap some QR codes onto your DVD collection and link it to a trailer so that people can get a better sense of the content of the DVD than what they’d get from reading the back of the case? Cost: A small square of paper and about 30 seconds of your time. Or how about putting QR codes on book shelves that will guide readers to additional selections? “If Hunger Games is checked out, try something similar from this list.” How about next to the car repair books, a QR code to link patrons to the online Auto Repair database? You’re already paying for the database — encouraging more use gives your library a better return on investment. The uses of these easy-to-make tags are only limited by your imagination. Moving beyond QR codes, you can build custom apps based on GPS using a free service like Layar. This is a do-it-yourself-able option for creating GPS-based AR apps. The Museum of London’s Street Museum app could be used by any library or museum with an archive of historic photographs. Or use it to locate books on your shelves, or to link those books to alternate resources. And then there’s Aurasma, an AR building application that uses object recognition to overlay data onto the real world. Whether it’s a photo of your library, your library logo, or any number of objects found in your physical library, you can make them interactive in a way that is both fun and educational. Living books or interactive charts and graphs for data are the low-hanging fruit. Add in some ingenuity and the opportunities are endless. Augmented Reality is now here and is not going to go away. It will continue to grow and evolve and expand into almost all aspects of our lives. The time to embrace it is now, while libraries can still have the option to play a role in how data is compiled and content is delivered. 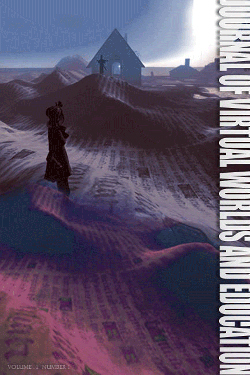 This groundbreaking journal is the first to be devoted exclusively to the use of virtual worlds as education platforms, and is rich with research in this emerging field. The inaugural issue contains more than 200 pages of research on the pedagogical uses of virtual realities, featuring works by educators and scholars from around the world. As we begin work on the second issue, I am excited and intrigued by the growth of virtual worlds and look forward to research into the educational use of Second Life, Open Sim, Blue Mars, Open Wonderland, Cobalt, Active Worlds, and others. Please check the submission guidelines for more information. in which scientists will forecast the future of energy and water in a 24 hour experiment. Part of The Signtific Lab’s Massively Multiplayer Thought Experiments, the idea is to bring together scientists and thinkers to solve world problems using a serious games model. Game Design and Development is huge. It’s a field that is growing now and will continue to grow as gaming environments become more ubiquitous. The Association for Women in Computing Upstate New York Chapter is sponsoring a talk on gaming technology and related career opportunities at Rochester Institute of Technology on Thursday, January 22. Come learn about the fast growing Gaming Industry and the opportunities and technology involved. Presented by Andy Phelps, Director of Computing & Information Sciences for RIT. Bring your entire family – this one if for all ages! The conference takes place Monday (12/08/08) at The Tech Museum of Innovation and Adobe Headquarters in San Jose, and then on Tuesday (12/09/08) at Stanford University. And for those of us who are not on the West Coast, we can attend both days in Second Life. Register now before all the FREE virtual tickets are taken! Steve Wozniak, co-founder, Apple Computer, Inc. This should be an extremely valuable two days for anyone interested in where technology is heading. I’ve got my virtual ticket and my avatar, Rebekah Cavan, and I will be there both days. I love ThinkGeek.com. It’s chock-full of great tee shirts, gadgets, toys and electronics that are sure to fill your geek heart with lust and envy. They seem to have first dibs on some great new technologies and they put them out there for the rest of us to buy. Reasonably priced, too. 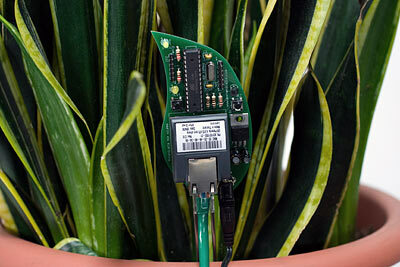 Who wouldn’t want a plant to post its status to Twitter so you know when to water it? Interested in a guided tour of Second Life? If you’ve never been in-world and want to see what it’s all about, or if you’re a seasoned pro and just want to see some new sights, join me tonight at the Fairport Public Library for a presentation on Second Life. We will tour some non-commercial areas including science, art and music as well as libraries, museums and universities. Second Life is a free, online world created entirely by its inhabitants. Come explore this world and see how it is being used to create an interactive, 3D interface to the web. Find out how easy it tis to join millions of people worldwide interacting, in real time, in this virtual space. ** You must register for this program by calling the library at 585-223-9091 or on the library website. This free event takes place at the real (brick and mortar) Fairport Library on Wednesday, October 8 at 7 pm. I caught this on Webmonkey yesterday and was blown away by this video production that Michael Wesch presented to the Library of Congress on June 23, 2008. Dr. Michael Wesch is an assistant professor of cultural anthropology at Kansas State University, and is doing some very interesting work in the field of digital ethnography. More information can be found at Mediated Cultures, and at Anthrovlog. Check out this list of projects going on at MIT’s Convergence Culture Consortium. It’s an amazing field and well worth watching what these people are doing. This article from Wired goes back a few months – it’s from January. But it’s still relevant. Anyone involved with Second Life is likely to know that NASA has made a large commitment to virtual worlds and their potential for reinvigorating public interest in the space program. I’ve attended and blogged on some of NASA’s mixed reality events. It’s a fantastic medium for open discussion. What’s particularly heartening about the Wired article is the fact that NASA sees the huge potential of connecting lonely astronauts with their loved ones through virtual worlds. If you’ve been in-world, you know how real it feels to have a conversation with another avatar, compared to sending an email or even using the phone. It feels like you’re really in the same space, in real time, sharing a moment with another person. For long-distance relationships, this really is the next best thing to being there. Were you totally wowed by Microsoft’s Surface? Trying to figure out how to come up with $10K so you can have one for yourself? Save some cash and build your own instead! Technology Review has an article on Eyebeam engineers who created an open source version, and there’s a nice exploded-view image of it at Gizmodo. At a mere 500 bucks for parts and some hands-on building time, who wouldn’t put this multi-touch table on their wish list? And just as a reminder: Microsoft didn’t invent this technology. Here’s a fantastic video of Jeff Han showing his multi-touch display for Perceptive Pixel, and another from Mitsubishi Electric Research Lab. Is your first life getting in the way of your second life? Does your avatar get cranky if left unattended too long? Are real life meetings a bore compared to in-world events? Pop into Second Life whenever you want, using your mobile phone. The app is free, but you’ll need to know a) if your phone is compatible (check the website) and b) what your phone service charges for airtime. If I can get my phone to run the program, I’ll be reviewing the usability of the application in the very near future.